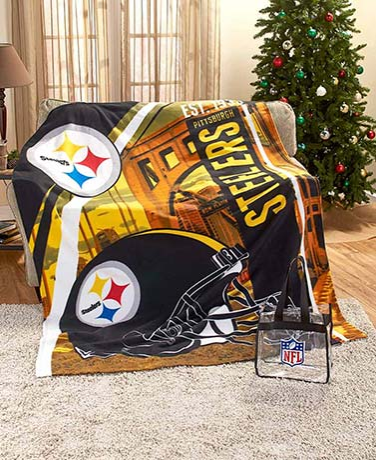 This Jumbo 60″ x 80″ NFL Fleece Throw with Tote provides warmth and coverage at the game or at home. The fleece blanket features the team name and the year established. 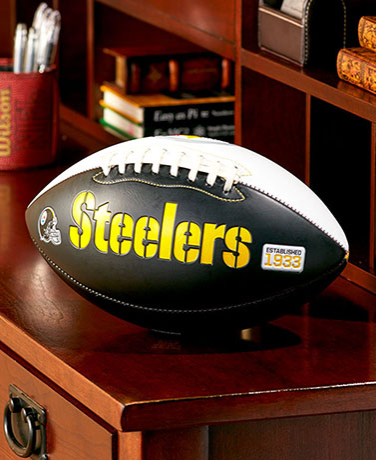 The NFL Stadium Collectible Football features a high-gloss, panoramic image of the team’s stadium on one side, and team name plus year established on the other side. 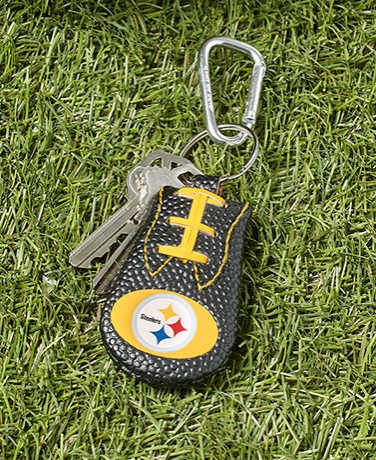 The NFL Genuine Football Leather Key Chain is made of authentic football leather and laces, and features your team’s logo and colors. It also has a carabiner on the key ring. 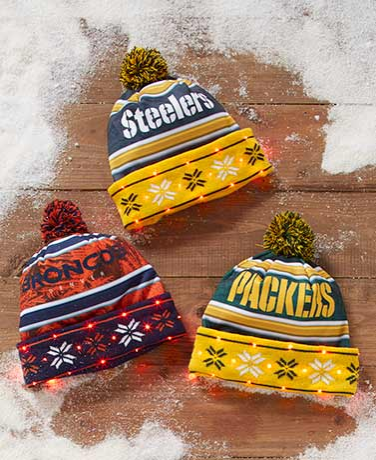 The NFL Light-Up Hat features twenty color-changing lights that surround a snowflake designs. Each festive light cycles through bright shades of blue, green, red and yellow. 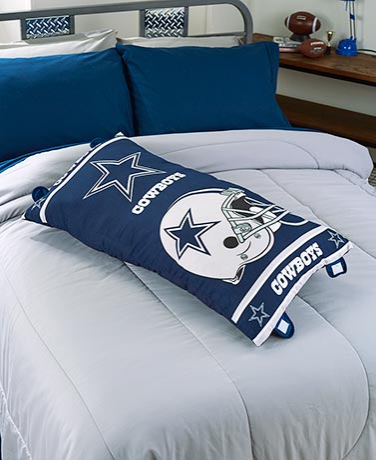 The NFL Bed Rest features your team’s colors and an extra large logo. Its sturdy, soft construction keeps you propped up. It also has a pocket, and a handle for easy lifting. 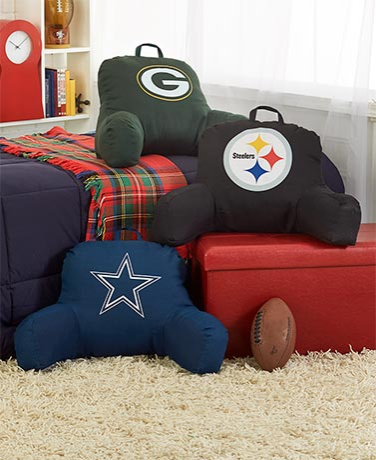 The NFL Foldable Body Pillow features your favorite team’s logo as well as their helmet and team colors. Folds in half for a different level of support and makes it easy to carry. 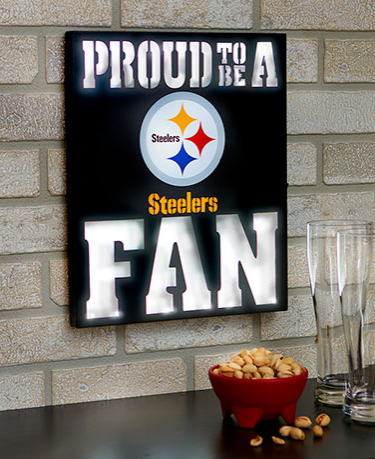 The NFL LED Metal Wall Art reads “Proud to be a ____ Fan” with the team name and logo in the blank. When you flip the switch, white LED light glows through the letters. 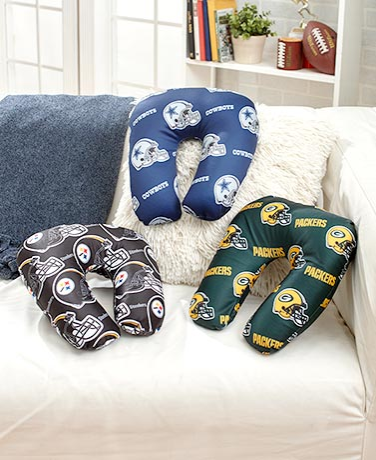 The NFL Squishy Neck Pillow features an all-over pattern on a silky spandex shell with your team’s logo. U-shape and microbead filling provide ample support from all angles. The 32-Oz. 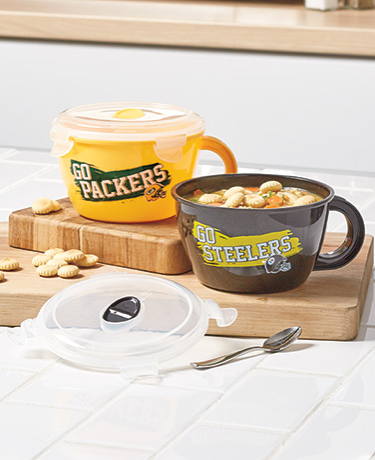 Oversized NFL Soup Mug with Steam Lid is decorated in your favorite NFL team’s colors, helmet and logo with the phrase “Go (team)”. The lid secures with snaps. The NFL Chef’s Comfort Mat provides comfort underfoot while whipping up food for the game. 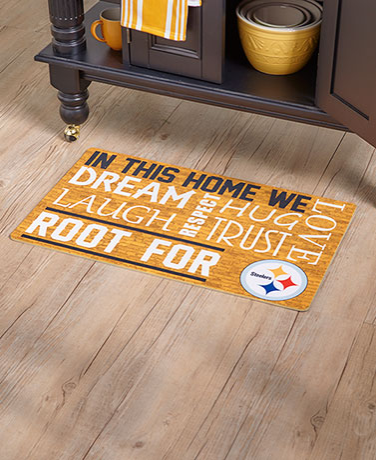 The mat features a sentimental family phrase with your team’s logo and colors. 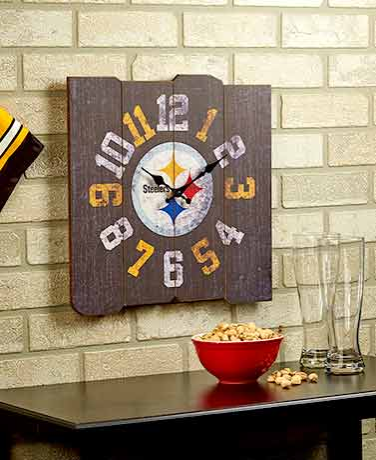 This Oversized Vintage NFL Wall Clock is composed of 4 wooden slats with your team’s logo in the center. Has an antique-shaped hour and minute hands to complete the look. 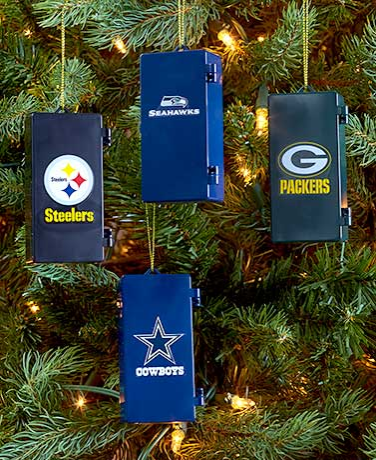 The NFL Locker Ornament exterior features your team’s colors and logo. The interior features miniature versions of a football, player jersey and helmet – like a real locker. 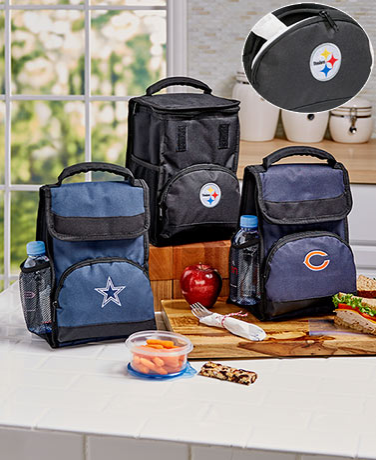 The NFL Insulated Lunch Tote has a fully insulated interior, an exterior zippered pocket with your football team’s logo on the front and a side mesh pocket with elastic opening. The colorful Women’s NFL Knee-High Socks show off your team in a fashionable way. Each sock has the team’s logo at the top of and colorful hearts right down to the toe. Serve up game time favorites with this 20-Oz. 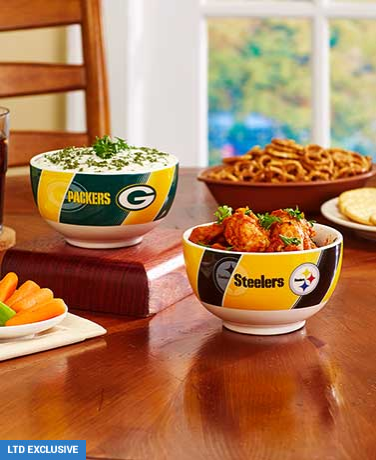 NFL Game Time Bowls. The exterior features your team’s colors, name and logo with diagonal stripes in the background. 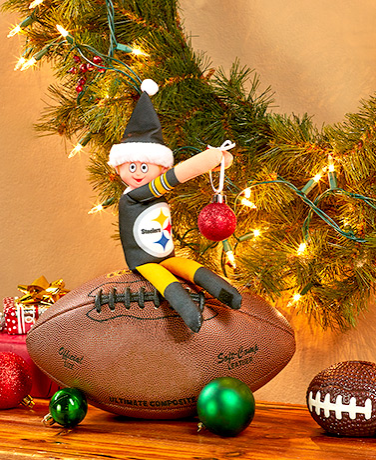 Fabric-magic on the arms and legs of this NFL Team Elf lets you hang him wherever. The elf makes a fine addition to your holiday decor or the perfect gift for a football fan. 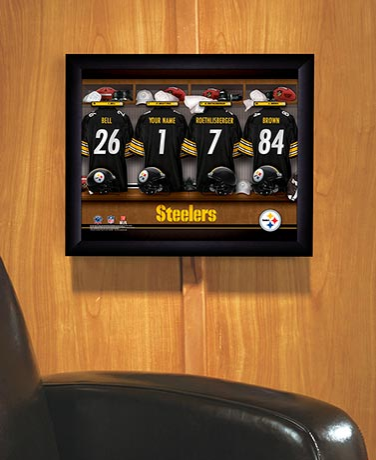 Personalized NFL Locker Room Print is a great gift for any true NFL fan. The collectible print will have “his” or “her” jersey hanging alongside players on their favorite NFL team. 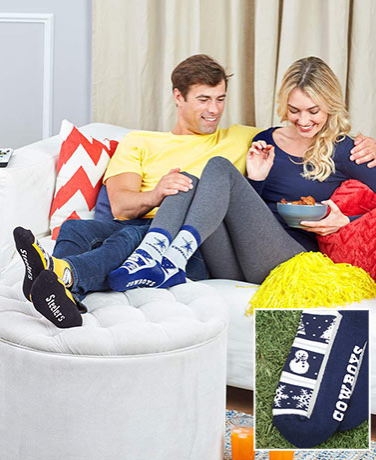 The thick NFL Holiday Slipper Socks with Grippers features snowmen, Christmas trees and snowflakes on the top, with team name and nonskid rubber grippers on the bottom. 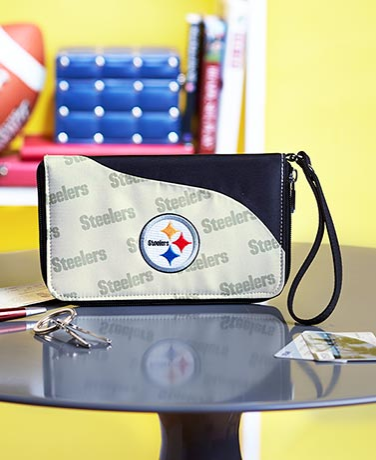 The NFL Cell Phone Wallet Wristlet features an embroidered team logo on the front and has a wrist strap for carrying. Interior includes pockets for credit cards, cash, and ID. 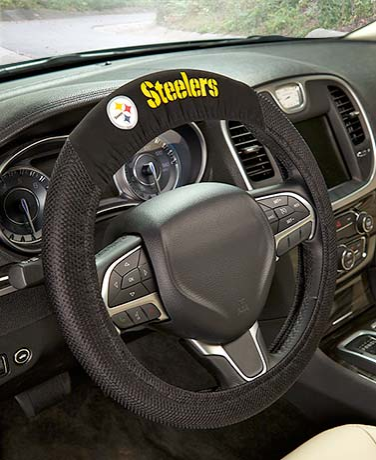 The NFL Steering Wheel Cover features your favorite team’s name and logo. The thick, mesh-like fabric helps you get a better grip on the wheel and keeps your hands warm. 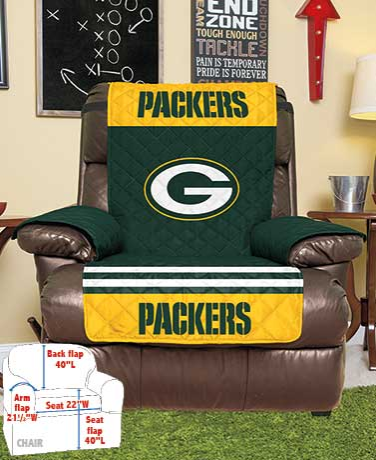 The one-piece NFL Chair or Recliner Cover features a diamond-stitch construction to withstand everyday wear and tear, while the anchor band keeps the cover in place. 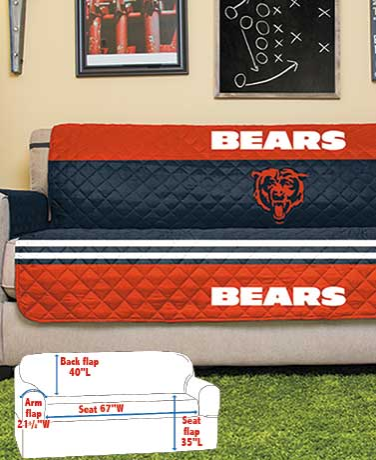 The reversible NFL Sofa Cover helps protect your sofa from stains, spills, pets, kids and more. Quilted using pinsonic, diamond-stitch construction. Anchor band keeps it secure. 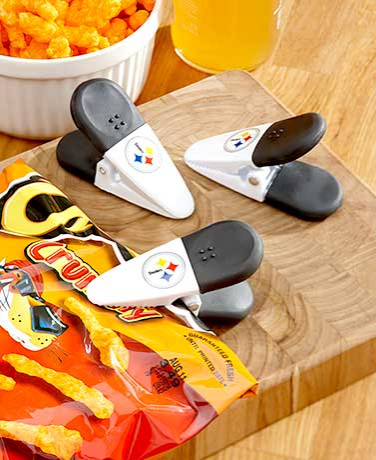 This versatile Set of 3 NFL Magnetic Chip Clips has a magnetic back, letting your hang pictures or notes on a fridge or file cabinet. Also great for snack bags or leftover chips. 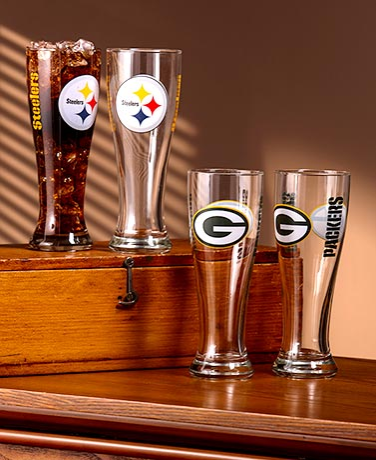 Each of these NFL Pilsner Glasses features the team logo on one side and the team name going up the other side. Holds an entire pint of your favorite brew. 16 oz., each. This roomy 22-Oz. 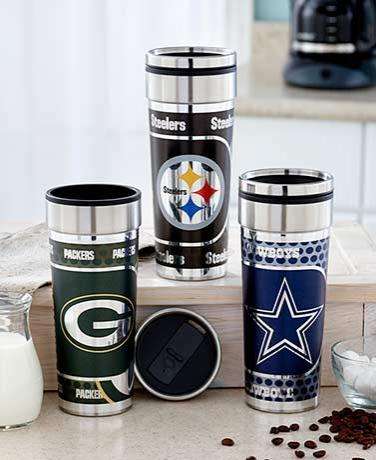 NFL 360° Wrap Travel Tumbler has a modern wrap featuring your team’s logo. A nonslip bottom keeps your drink in place, and its lid has a sliding cover. 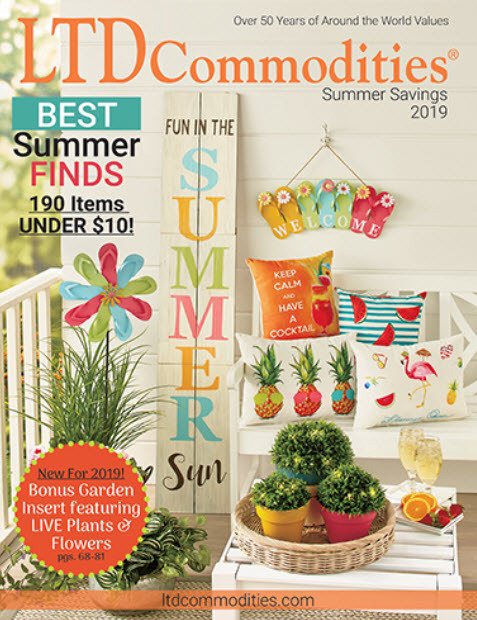 Our Autumn Style Catalog has over 600 items! 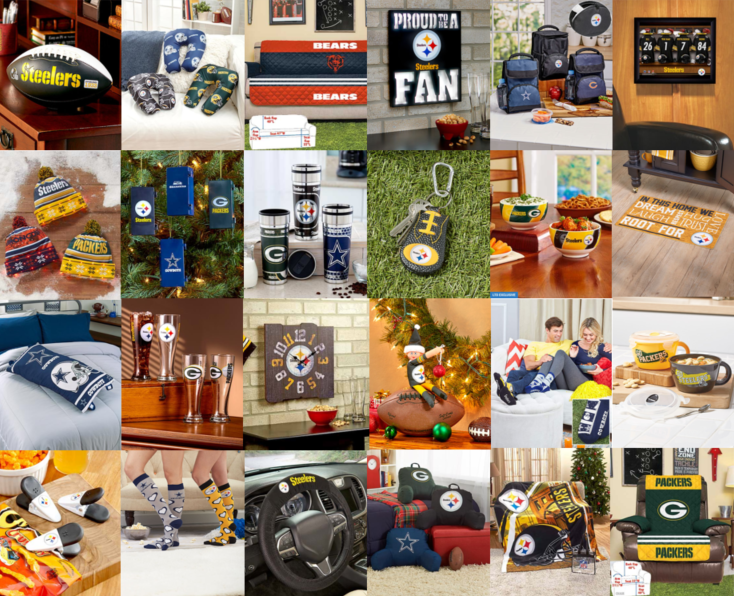 Check out all of our newest items today! I would think it would be nice if you could offer all teams! Hi Karen – We apologize that we don’t carry all teams. We perform numerous tests to determine the items carried in our catalogs. Based on the results of these tests, the most popular colors, designs, teams, initials etc. are made available to our customers. Although the item you are inquiring about is not available at this time, it may be available in the future.